New Decorations and a Playthrough! This weekend I had a blast. We ended up playing through Descent Second Edition with the App for the first time and we did a little bit of decorating. 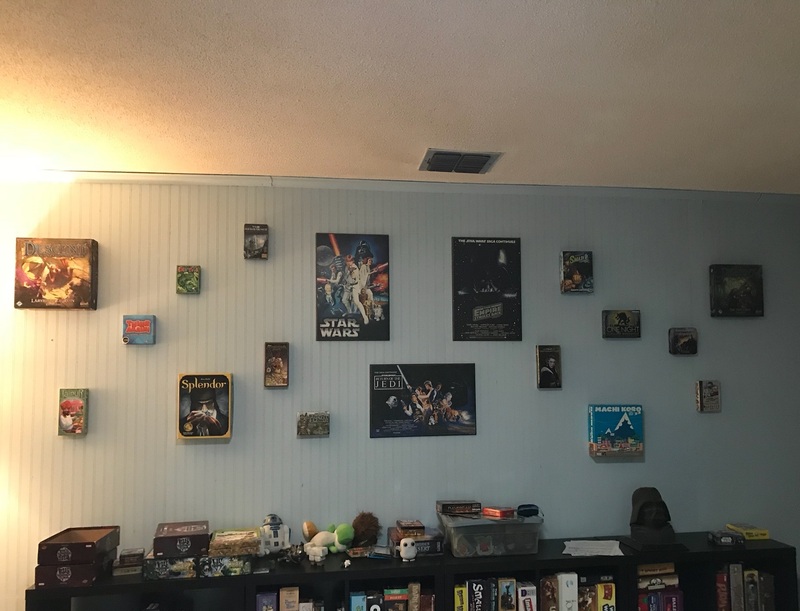 We did the decorating yesterday by putting up empty game boxes on the wall as well as putting up my Star Wars wooden plaque picture things. I saw it on a board game group on Facebook a couple of years ago, and had been saving up empty boxes instead of tossing them. I still own most of the games up there, but there are a few that I do not. I think it turned out pretty good. 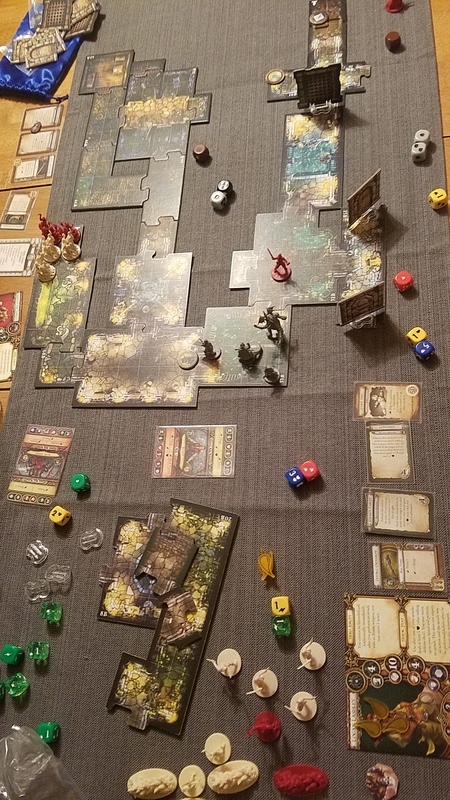 We also played Descent Second Edition with the App. I have had the App for a long time but had never played with it until Saturday. It was really fun though there are some positive and negative notes I'll share about the App. On a negative note, the App's doors and transition points sometimes covered up the tile numbers or made them hard to read. It was also hard to figure out where to use some of the transition tiles or what they were at first. Towards the end we started taking a bunch of damage with no warning, which tried to rush us into finishing the quest. I found it to be out of the blue and it didn't ramp up at all, it started at a pretty high number and didn't feel super thematic. Also, at the beginning, it gave us a list of a bunch of tiles to set aside to be used throughout the adventure. However when going through the dungeon, we had to pull out 3-4 room pieces that weren't listed. It was only a minor annoyance as the pieces are sorted into different bags, but it was still an annoyance. Sometimes the actions by the enemies were hard to figure out or sometimes it would just say "spot the closest hero" and do nothing else unless they were super close. So we made "spot" changed to move towards the closest hero and attack with range if able. The melee enemies always said "engage" so I think that is the key difference that wasn't apparent from the beginning. On a positive note, it allowed us to use various expansion content together that normally scenarios wouldn't have together as otherwise you'd have to buy certain expansions to get others. I have quite a bit of the expansions so this was the best part about the App. It felt more D&D-esque with each transition point exploring more of the map and giving certain roleplaying descriptions and cues. The weekend was great and I had a ton of fun playing one of my favorite board games with my roommates. The decorations look great and after I arrange a few more things and put a few more other things together, it will look even better.